Eltronicschool. - This is circuit schematic of Motorcycle Battery Stabilizer using Capacitor Bank for you who want to make your motorcycle will fuel economic, the battery more work with long time and other. In this time, beside we will give you circuit schematic of Motorcycle Battery Stabilizer using Capacitor Bank, we also will give you global description and the last we will give you link to read more about this circuit from original source. Circuit schematic like in Figure 1 above is Circuit Schematic Motorcycle Battery Stabilizer using Capacitor Bank. According ElectronicKitSchool blog describe that Capacitor bank usually used in many application in electrical and electronic field like be used in motorcycle to refine the performance. Capacitor bank in motorcycle design to give many advantages as follow. 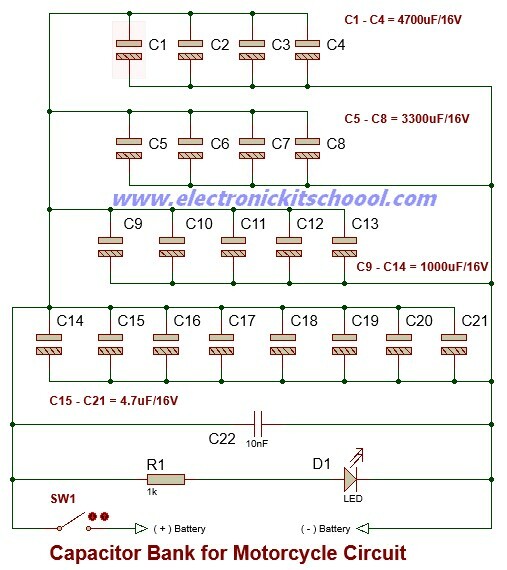 And now you can read more about this Circuit Schematic Motorcycle Battery Stabilizer using Capacitor Bank with how to build this circuit, please visit the original source using the link here.